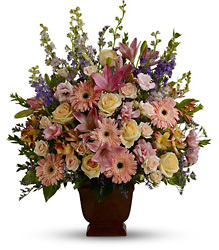 There are many ways to express your heartfelt sympathy at a funeral service. Some prefer a traditional funeral arrangement or standing spray on an easel, others prefer a vase arrangement or dishgarden. Below you'll find decriptions of various funeral designs and a catalog of items available in each category. We are also happy to accommodate special requests whenever possible, so just give us a call if you would like a custom arrangement. Typically these arrangements are placed at the visitation, funeral service, and then transferred to the graveside for the last service. If you would like to send your sympathy to the services, but would also like it to go home with a family member, then the styles in this catalog are appropriate. Here you'll find planter/dishgardens, table arrangements, and more. These items are not typically taken to the graveside services. Express your love and sympathy with a lasting keepsake that will bring comfort in the days ahead. We have a beautiful selection of inspirational throws, from angels to the 23rd Psalm. Each throw is from Manual Woodworkers & Weavers, Inc in Hendersonville, NC and are approximately 51" x 68". Their quality and design make them a truly special gift that will convey your sentiments long after the services are over. For funerals, we can display your inspirational throw on a rented easel with a coordinating bow. You can also choose to have your throw trimmed with a beautiful spray of fresh or silk trim.